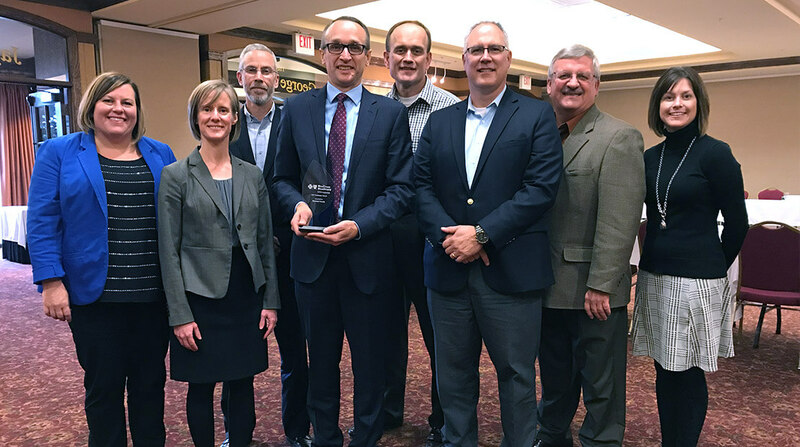 As community stakeholders were brought together last week to talk about improving health in Austin, Hormel Foods Corp. was presented a Blue Cross and Blue Shield of Minnesota Trailblazer award. The Trailblazer honor showcases the Austin-based company’s innovation and collaboration to improve health, according to a Blue Cross news release. “It’s really a focus on our efforts on corporate responsibility over the last number of years,” said Hormel Foods Vice President Kevin Myers. “We’ve had a focus on really working on several things from a product standpoint including lower sodium levels in many of our products and a clean label focus. Some work that we’ve done on Project Spammy certainly fed into this as well. “We’ve done a lot of work with the Cancer Nutrition Consortium in developing new products specifically for cancer patients. “So all of that is part of our food journey that we’ve been on for a number of years. Really, continuing on that, going forward we know we have work to do but we are really proud of receiving this award for the efforts we’ve done thus far. The award was presented to Hormel during a Blue Cross Trailblazer tour meeting with community stakeholders.